The galaxy IC 3583 is weird, and it's not clear why. Sure, it’s odd. But why is it odd? Galaxies are massive collections of stars, gas, and dust (and dark matter, too). They come in four basic shapes: spiral (like our Milky Way), elliptical, peculiar, and irregular. Irregulars are pretty much like the name says: They tend not to have an overall structured shape, but are, well, irregular. Still, despite that, some do have a semblance of shape, and it’s not always clear why. Take IC 3583, for example. 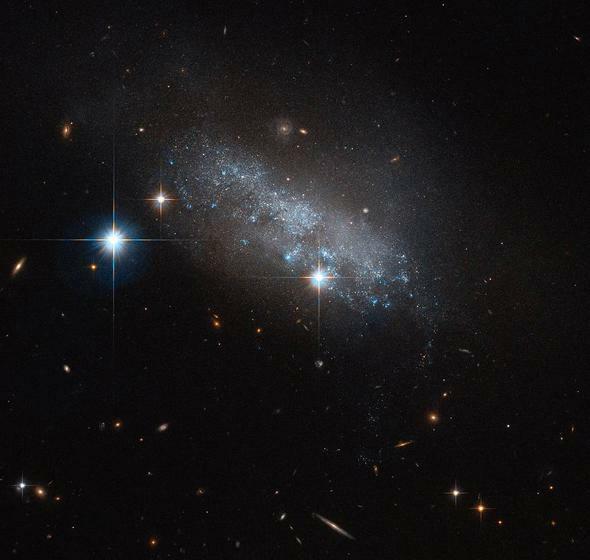 That’s the galaxy above, in a gorgeous Hubble Space Telescope image. It’s definitely irregular, but not quite. It appears to have a bar running across it, a thick rectangular structure. Many galaxies have bars (the Milky Way does across its core), even some irregulars. Usually they form from the weird way gravity works in galaxies; instead a single massive object in the center like the Sun anchoring the solar system, the mass of the galaxy is spread out, and that can cause odd structures to form like spiral arms and bars. It’s possible a bar like that could get its start if the galaxy interacted with another one; the gravity from a bigger galaxy can pull on the smaller one and distort it, causing matter to move around and form bars like that. As it happens, IC 3583 sits very near a much larger galaxy, the spiral M 90—which itself looks weird; it has long streamers coming out of it as if it recently encountered another galaxy. Aha! So is that it? These two had a cosmic tryst, both leaving the encounter a little shaken? Not so fast. They appear to be close in the sky, but are they close together in space? Two objects can appear to be next to each other but at vastly different distances—like looking out your window past a tree in your yard to the mountains kilometers away. So it’s a legitimate question to ask if IC 3583 and M 90 are actually physically close to each other. And the answer is … we don’t know. One way to get the distance to a nearby galaxy is to look at some of its brightest stars. We know how much light those stars give off, so by measuring their apparent brightness, we can get a distance to the galaxy. And that’s where this gets weirder. M 90 is a member of the Virgo Cluster, a nearby and decently large group of galaxies. We’re pretty sure M 90 is a member, and that puts it about 60 million light-years away. But looking at the stars in IC 3583 indicates it’s only a little more than 30 million light-years away, well in the foreground of Virgo. If that’s the case, the two galaxies are unrelated, despite appearances. But wait! I said M 90 looks weird too; how can that be then? It turns out that galaxies like M 90 can be moving through the cluster rapidly, and the gas that exists between the galaxies can strip off the gas inside of rapidly moving galaxies. It’s like being in a car when your dog decides to, um, make a foul odor, so you open the windows, letting the air blow through the car, stripping away the mixture of methane, hydrogen sulfide, and mercaptans. So M 90 may be odd looking because it’s ramming through the cluster, and IC 3583 may look odd because sometimes irregulars are just odd looking. Coincidence. I know that’s not an entirely satisfactory answer, but here we are. Galaxies, even nearby ones, are still quintillions of kilometers away, and that’s a long haul. It can be difficult to know everything about them … but then, that’s why we study them! We know way more about them than we did a century ago, but that doesn’t mean our knowledge is complete. Science is a journey. There may not be a single, vivid end to that journey, though it tends to steer toward the path of reality. The fun part is the learning, of solving mysteries along the way. We may never finish—I certainly hope not!—but there’s a lot to see and do along the way.